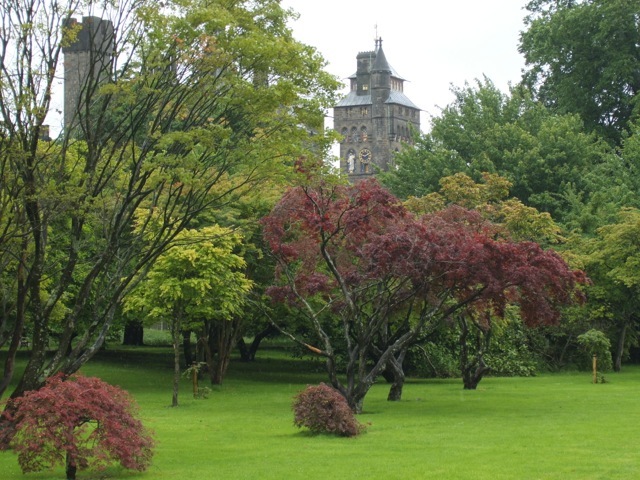 I’ve always noticed a special atmosphere outside the castle, most noticeably at Christmas and on St. David’s Day. It’s very picturesque when decked out with twinkling fairy lights or crowned with daffodils. Also, in the summer you can see the tourists arriving by the coach load, pausing at the gates to take a group photo, before entering. The festive feel of this walled castle projects a vibrancy into the city. I often wondered if I were missing out on something by not making a visit, as I would rush by on my daily commute. 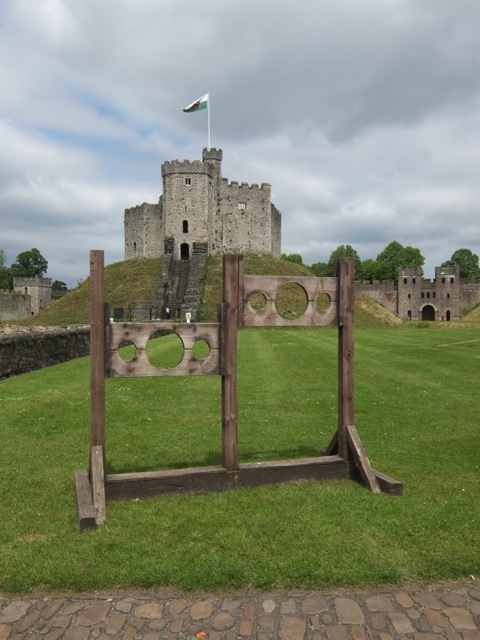 I finally decided to make a visit to Cardiff Castle last Monday, and was very pleasantly surprised by what I saw. As soon as I entered the castle grounds on my visit, I felt welcome. They have someone to meet and greet, who also informs you of the time of the next guided tour. I decided to join a tour, which takes you through a selection of Victorian apartments normally locked to the public. Entry into the castle isn’t cheap, but once paid for, you can stay there the whole day. If you live or work in the city, you do have the option to sign up for a Golden Key ticket, which allows you free entry for three years. For those who don’t, there’s also the option to buy a twelve-month season ticket. 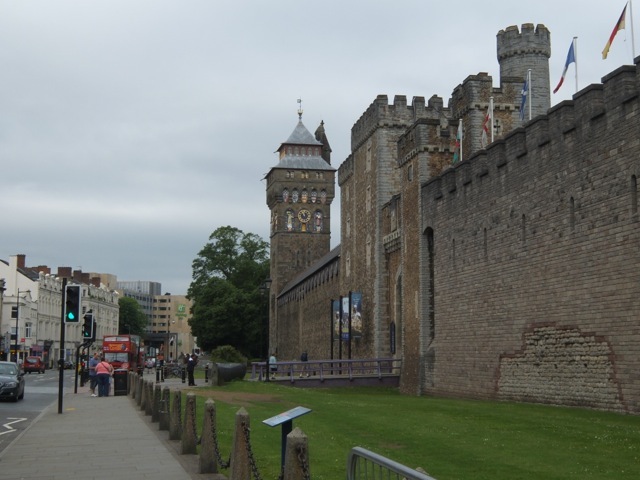 Cardiff Castle has existed in one form or other, since the first century AD. There’s evidence of the Roman influence in the stonework of the castle walls. 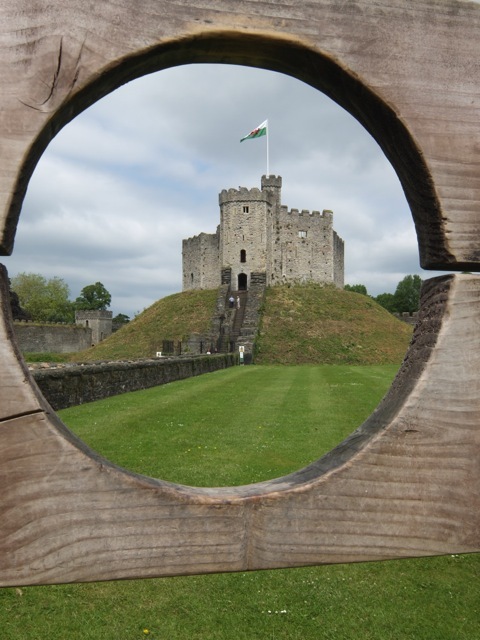 Apparently, the Roman fort would have originally been of wooden construction, but this was replaced by the twelve-sided Norman Keep which can still be seen today. 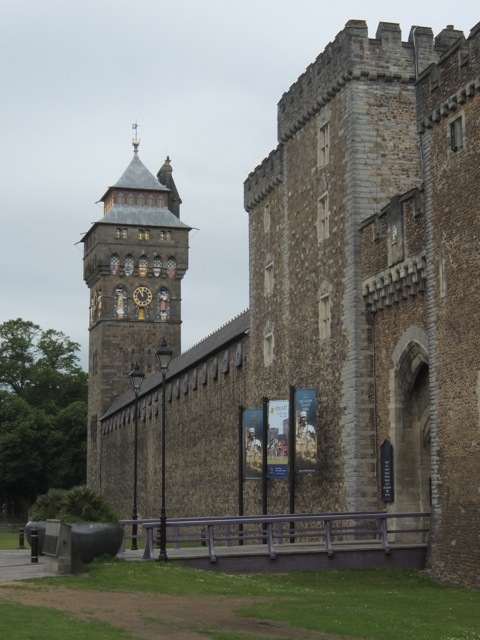 Perhaps the most radical changes to Cardiff Castle were due to the Bute dynasty. 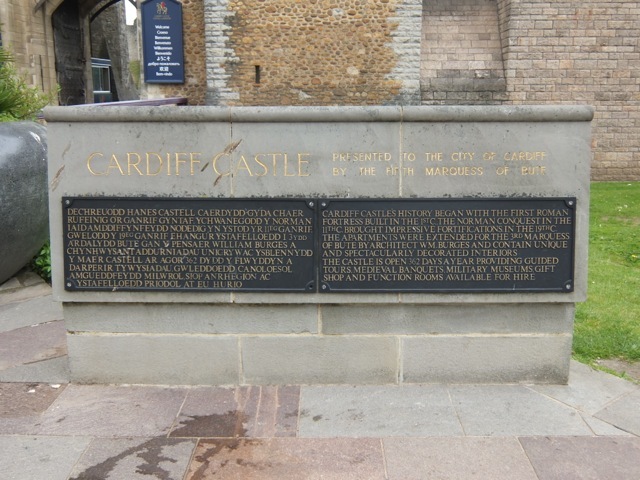 The second Marques of Bute had much influence on turning Cardiff into the city it eventually became. In 1839, he built a dock, now known as Bute West Dock. 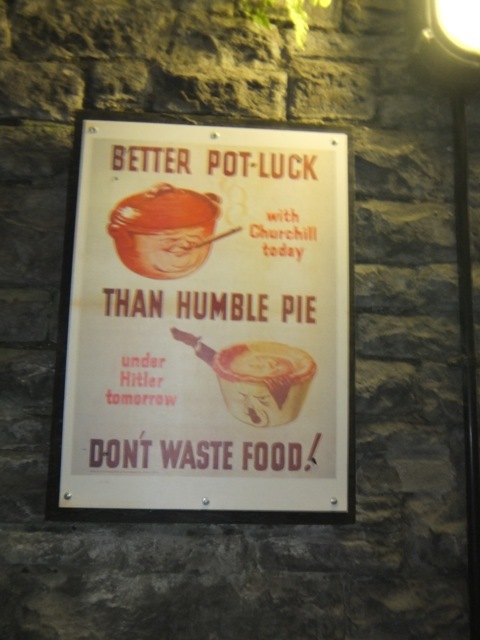 His influence led to Cardiff becoming an international importer of iron and coal, and also led to a huge expansion of the population throughout the nineteenth century. 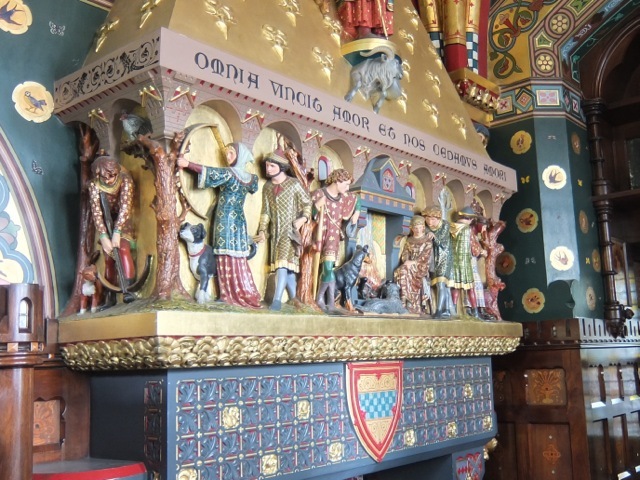 It was his son, the third Marques of Bute, who collaborated with artist and architect William Burges, to dream up much of the romantic Gothic revival style that characterises the Castle Apartments. The first part of the new castle to be built was the magnificent clock tower, intended to be bachelor quarters for the young Marques. There is a running theme, of the passing of time, within the Clock Tower. 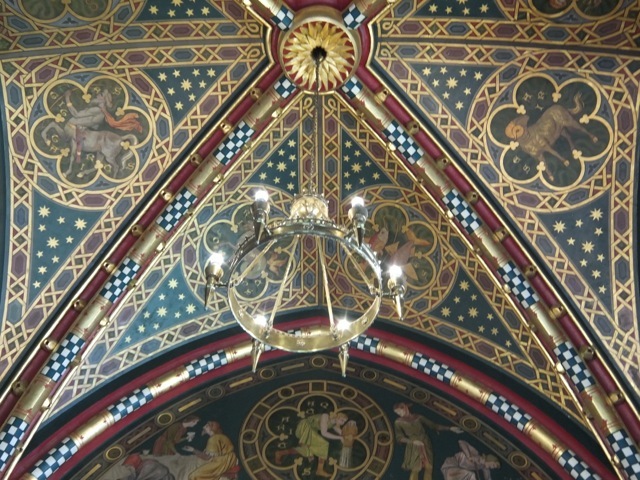 For instance there are stained glass windows designed to depict various days of the week, and astrological signs painted on the ceiling of the Winter Smoking Room, one of the featured rooms. 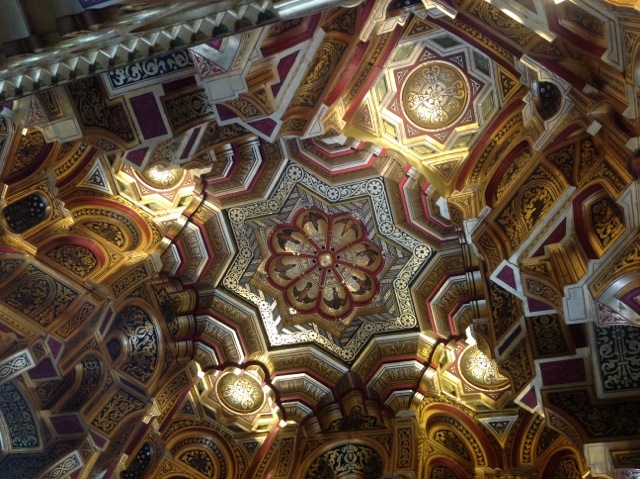 Burges also played upon the passage of the sun within his design schemes. 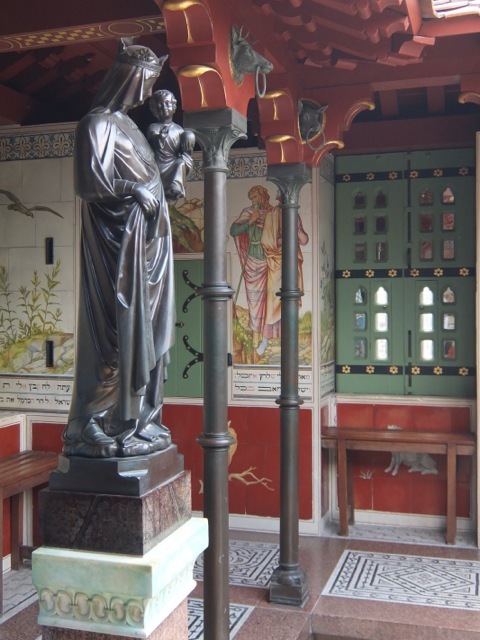 In the roof garden of the West Tower, he created an optical illusion with the statue of the Virgin and Child. A Mona Lisa smile plays upon the Virgin’s face as the sun moves from east to west, and its rays soften. 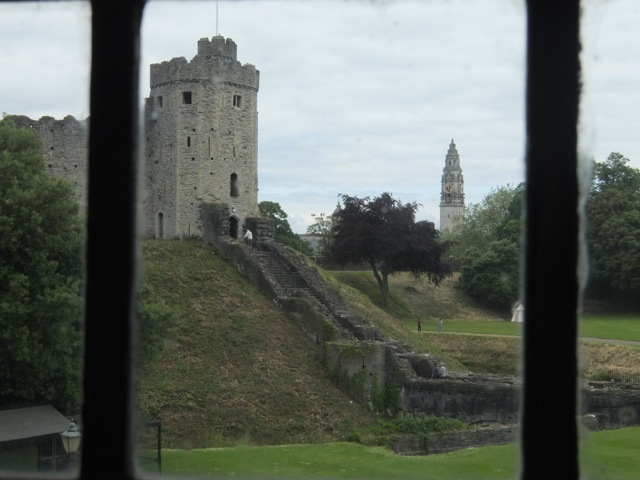 Time has not stood still in Cardiff Castle, since the Victorian era. 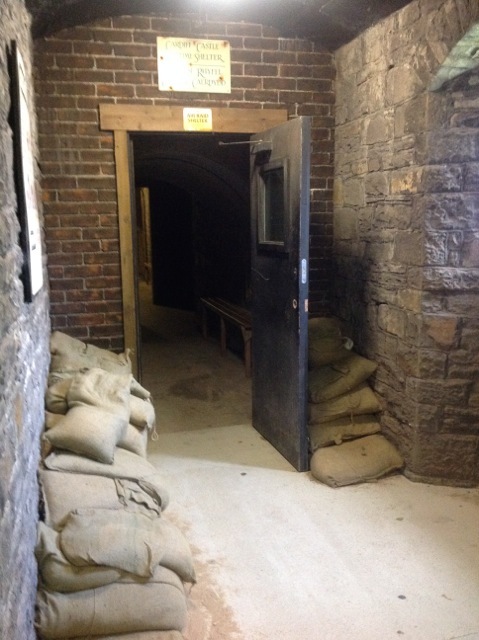 Within the castle walls are also the air raid shelters, which would have been deployed during the Second World War. These were big enough to hide approximately 1,800 people. 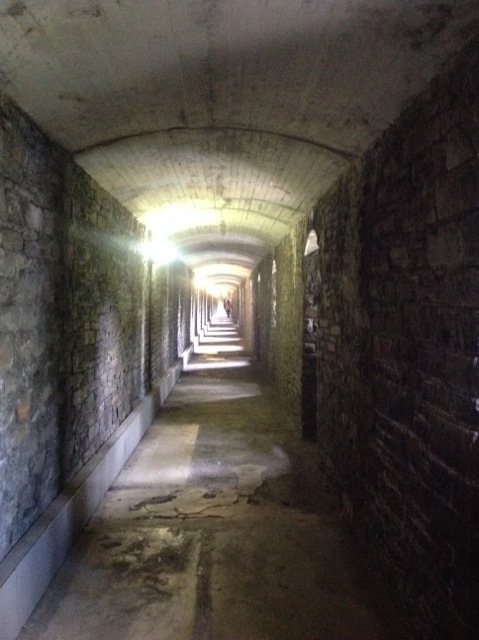 The expanse of these tunnels takes you right round to the back of the castle, near to the Keep. Some parts are still fortified with blackout windows. 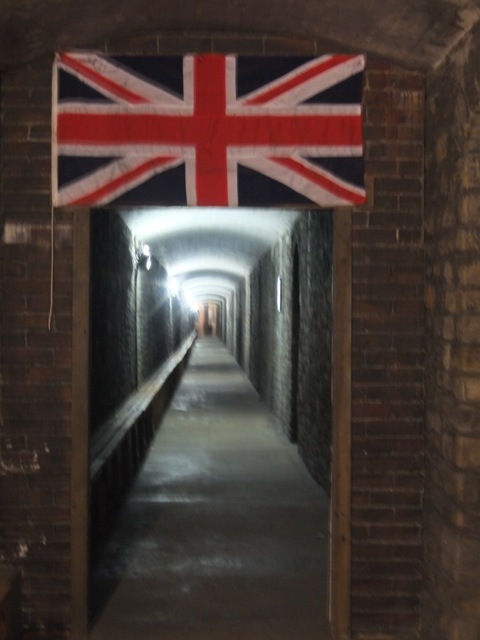 Within the tunnels, the wailing of air raid sirens, and the crackle of a gramophone record playing Vera Lynn transport you to another era, as do the advertising slogans of that decorate the walls. Even today, parts of the castle are in use. As the expert who led the tour of the Castle Apartments informed me, the Banqueting Hall is available to be booked up for functions and weddings. It’s still the place for royalty, and celebrities alike, to dine in style. I could tell you so much more about the castle, but I’d urge you to explore, and discover for yourselves.